1. Set oven to 350 degrees Fahrenheit. 2. Cut open the squash and roast in the oven for about 30 minutes. 3. In the meantime chop the garlic and parsley. 4. Grab the scallops and make sure they are at room temperature. 5. Pat the scallops dry to remove excess moisture. 6. At this point, set the pan on a medium to low heat. 7. Make sure the pan hot and place the butter in the pan. 8. Melt the butter and quickly add the garlic. 9. Cook garlic for about 2 minutes or until toasted golden. 10. Place scallops and carefully place one by one on the pan. 11. Cook each side for about 5 minutes or until slightly brown. 12. As the scallops cook, squeeze the lemons on the scallops and sprinkle the parsley. 13. Remove the scallops from the pan and let rest. 14. Grab the spaghetti squash and pull the pulp out with a fork. 15. You can add the squash to the pan where you cooked the scallops and let it soak up the flavors. 16. 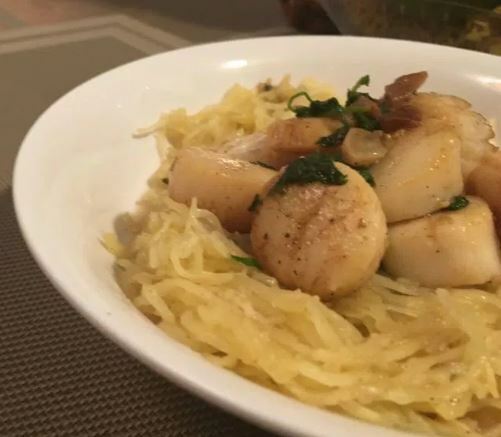 Serve the spaghetti squash in a bowl and place the scallops on top. 17. Squeeze more lemon or add more butter if desired.